← Poverty is a SHAME not religion. 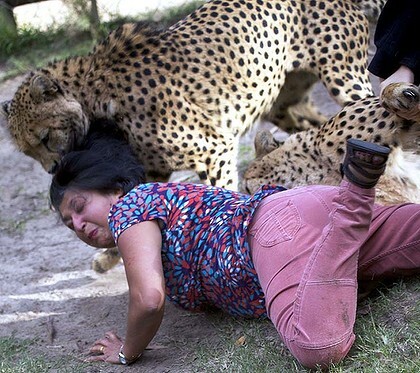 The photos taken by a tourist from Scotland show his wife on the ground, hair flying, blood on her neck, with two cheetahs nearby. 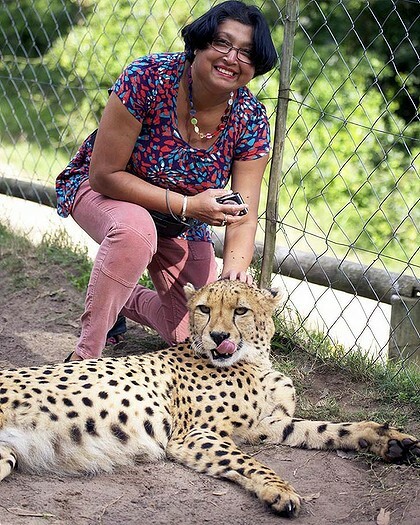 The Port Elizabeth Herald reported that Violet D’Mello of Aberdeen was attacked by cheetahs on April 28 while in a petting pen with the animals at the Kragga Kamma game reserve near Port Elizabeth in southeastern South Africa. It says she was attacked while trying to protect young children from another group that was in the enclosure at the same time. Her husband took photos of the attack, which were published by the local newspaper and others. 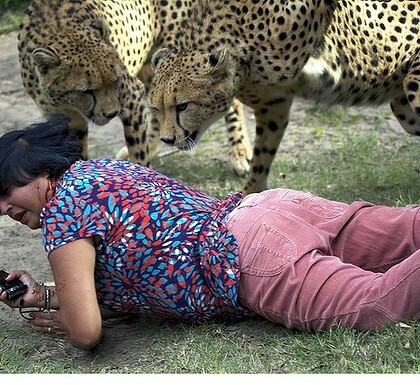 One of the photos taken by Archie D’Mello shows his wife Violet smiling and posing with a cheetah raised by humans in the enclosure, before, as she told the Herald, “it became serious very quickly”. One of two cheetahs in the enclosure first grabbed a young girl, leaving her with scratches and cuts that needed stitches, the paper reported. Violet tried to calm the child and her brother, and ended up also being attacked. She told the BBC she had numerous bite and puncture marks, and that her scalp was “sliced open”. The cheetahs “weren’t being vicious. You could tell they were just excited”, Violet D’Mello told the Herald. The Herald said park staff and other visitors pulled the cats off. The D’Mellos continued their holiday in South Africa.